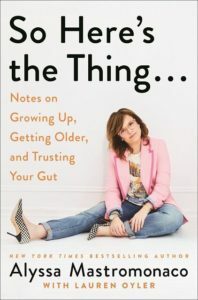 So Here’s the Thing…: Notes on Growing Up, Getting Older, and Trusting Your Gut is a no-nonsense and no-holds-barred twenty-first-century girl’s guide to life by Alyssa Mastromonaco, the former White House deputy chief of staff under President Obama, New York Times bestselling author of Who Thought This Was a Good Idea?, and contributor to Crooked Media. In So Here’s the Thing…, Mastromonaco revisits the life lessons she learned while traveling the world and working for President Obama for nearly a decade, including two presidential campaigns. Turning her sharp eye and humor to the myriad issues facing women both in and out of the workplace, the book covers politics, careers, motherhood, sisterhood, and making relationships of all kinds. Interviews with friends and former colleagues range from Dan Pfeiffer on the power of platonic life partners to Monica Lewinsky on how to be a good cyber citizen. Mastromonaco leaves no awkward situation unexamined, like the time when Michelle Obama tried (and failed) to stop her from getting food poisoning during a state dinner in Tanzania, or when John Kerry may or may not have seen Mastromonaco in her underwear. In conversation with Symone Sanders, a democratic strategist, communications consultant, CNN political commentator, and former national press secretary for Senator Bernie Sanders’ 2016 presidential campaign. Book signing to follow.